A plague is among us. Spreading from place to place via fun runs, stag dos and charity events, it preys on a dangerous combination of good nature and group hysteria. Unadventurous homebodies may well find themselves immune as they fail to serve its insidious spread and ever-expanding grasp upon the population. Instead, the fit and the sociable are much more likely to succumb. Localised to the arms and torso, this plague manifests in myriad ways. Amid mass outbreaks, generic symptoms are expected to present. However, in the case of smaller, more concentrated outbreaks, symptoms have been know to adapt to the individual carrier, mirroring their characteristics. Ladies and gentlemen, we’re in the midst of a t-shirt epidemic. Over two billion t-shirts are sold each year. That’s two billion t-shirts that each take around 3,000 litres of water to make. As much as the average person drinks in three years. Just let me do the maths… Yes, that adds up to approximately LOADS of bloody water. They’re seriously thirsty garments and most of us already have too many of them. Yet we still can’t get enough. It’s no longer enough to have done something. Or even to have done something and captured the moment in a photograph. No, now we have to have a t-shirt as a memento too. We’ve all seen someone down the gym wearing an ‘I ran the *insert local town/city* 5k’ t-shirt. Maybe you are that person. I’m not here to ask why they/you need people to know you ran that 5k three years ago, but I am here to ask why, exactly, we need a t-shirt thrusting into our sweaty palms at the end of every single race. What do prolific runners do with all those t-shirts? Sew them all into a blanket? Burn them to heat their homes? Give them out as the world’s worst presents? Or maybe just bin them or send them to charity shops? I proffer a vote for the latter. But I’m not blaming runners for this epidemic. I’m not even entirely blaming the race organisers who decide to print the hundreds or thousands of t-shirts in the first place (I am a bit though) because it’s not just them. Everyone who went to Julie’s Faliraki hen do in 2015 got a t-shirt, personalised with cheeky nicknames or their significance in the bridal party. Everyone who went to Dan’s stag do last weekend got one too, but theirs had an embarrassing photo of the groom printed on it. Did you do a charity bungee jump? You probably got a t-shirt. A sponsored walk? T-shirt. Took on an eating contest? Went to a convention? Completed an assault course? T-shirts all round! Our appetite for t-shirts is insatiable. People grapple for free ones at baseball games and queue for them at corporate sponsored events. And they’re not going to people who need t-shirts. They’re going to people who can pay an entry fee, fill up a car with petrol, buy a train ticket or fuel themselves with enough food to run long distances on foggy Saturday mornings. We’re not filling the clothing poverty gap, we’re filling already overstuffed wardrobes. It is, for lack of a better phrase, utter, shitting madness. We need, as a society, to wean ourselves off t-shirts. Tell your mate you don’t want to wear a boxy, black Gildan t-shirt with a sexually suggestive nickname printed on it because you have a perfectly good, non-embarrassing top that you’ve been wanting to wear for ages anyway. 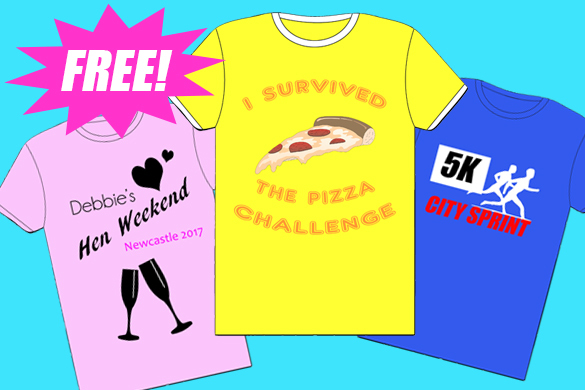 Email race organisers and tell them to quit it because if you get another t-shirt you’re going to have to buy a warehouse. Tell charities you’ll spread their name by wearing the t-shirt they gave you last time. Tell the restaurant that hours of debilitating heartburn is enough of a memento for taking on their pizza challenge. Tell the assault course that their faux army training t-shirt is going straight in your pyjama drawer and they won’t get any advertising out of it. Tell people whatever you need to. But please, let’s stop the epidemic in its tracks before the human race becomes nothing more than walking coat hangers, before we’re just seven billion semi-sentient hosts for this cotton plague. Side note: should I go into business designing awful t-shirts? I think yes. I absolutely love this post, you’re right it is utter shitting madness. I love t-shirts and they’ve long been my weakness to buy but t-shirts I actually want to wear. Not crappy promotional t-shirts for an event! I did laugh reading this because it reminded me of being forced into receiving a vest top for a friend’s birthday weekend away. Yes, complete with suggestive nickname on the back. I hated the damn thing, wore it once and it’s didn’t even see the light of day as pjs. This madness needs to end! I completely agree! I’ve turned down a a couple of t-shirts in the last few weeks alone. People just throw them at you! I was just thinking about this topic and here’s why. I’m originally from Northern California. Yes, the place where all those fires ripped through the countryside, vineyards, towns and neighborhoods and leveled everything to coal and cinders in a matter of days. Horrible, I know and yes, I feel for my friends and family who lost their homes. But, do I really need a tshirt? Yup, that’s what’s happening now. Opportunistic entrepreneurs now producing tshirts…the proceeds going to non profits aiding those affected by the fires. Is this necessary? I think not. Why don’t I just donate my money. Period. It’s tricky isn’t it because you don’t want to insult people’s efforts to help but equally, it creates another problem. Like you I would rather donate directly but perhaps in our consumer society, a product is more likely to create money.